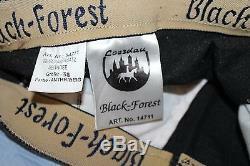 Loesdau Women's Black-Forest Charcoal/Beige Full Seat Breeches Size 26R. Smoothly tailored of Cotton, Polyester and Lycra blend for superior fit and maneuverability, the Black-Forest Full Seat breech features classic front-zip style made of a machine-washable synthetic fabric making this an easy care, comfortable ladies riding breech. No rips, tears or snags. Front zip with single hook and bar closure. 1 1/4 inch wide belt loops. Slant front pockets with single snap closure. Trim on pockets and ankles matches seat. 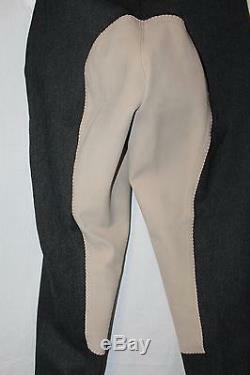 (13 1/2 measured from side to side across front of waistband with breeches lying flat and not stretched). 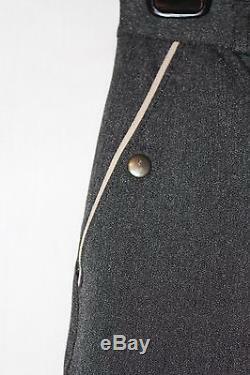 Outseam: 37 measured from the bottom of the leg to the upper edge of the waistband. Rise: 7 measured from bottom of zipper to top of waistband. 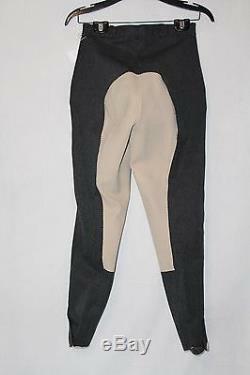 67% Polyester, 26% Cotton, 7% Lycra/li>. 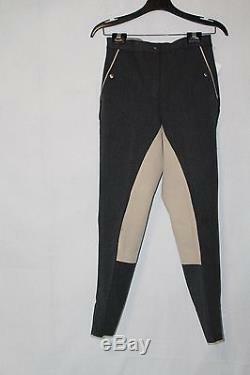 The item "Loesdau Women's Black-Forest Charcoal/Beige Full Seat Breeches Size 26R" is in sale since Monday, December 5, 2016. This item is in the category "Sporting Goods\Outdoor Sports\Equestrian\Clothing & Accessories\Women's Clothing\Jodhpurs & Breeches". The seller is "carpegle123" and is located in Panama City, Florida. This item can be shipped to United States, Canada, United Kingdom, Denmark, Romania, Slovakia, Bulgaria, Czech republic, Finland, Hungary, Latvia, Lithuania, Malta, Estonia, Australia, Greece, Portugal, Cyprus, Slovenia, Japan, China, Sweden, South Korea, Indonesia, Taiwan, Thailand, Belgium, France, Hong Kong, Ireland, Netherlands, Poland, Spain, Italy, Germany, Austria, Israel, Mexico, New Zealand, Philippines, Singapore, Switzerland, Norway, Saudi arabia, Ukraine, United arab emirates, Qatar, Kuwait, Bahrain, Croatia, Malaysia, Chile, Colombia, Costa rica, Dominican republic, Panama, Trinidad and tobago, Guatemala, El salvador, Honduras, Jamaica, Antigua and barbuda, Aruba, Belize, Dominica, Grenada, Saint kitts and nevis, Saint lucia, Montserrat, Turks and caicos islands, Barbados, Bangladesh, Bermuda, Brunei darussalam, Bolivia, Egypt, French guiana, Guernsey, Gibraltar, Guadeloupe, Iceland, Jersey, Jordan, Cambodia, Cayman islands, Liechtenstein, Sri lanka, Luxembourg, Monaco, Macao, Martinique, Maldives, Nicaragua, Oman, Pakistan, Paraguay, Reunion, Bahamas.